Pressed by the Sith Empire during the war, the Republic Senate sank its meager resources into ever-more desperate measures to end the conflict. One of the resulting projects was Hammer Station, a prototype mobile facility built around a combined tractor beam and massive gravity cannon. The tractor beam captured nearby asteroids, and the cannon launched the asteroids at near-relativistic speeds at a chosen target. No shield could handle that magnitude of kinetic energy. 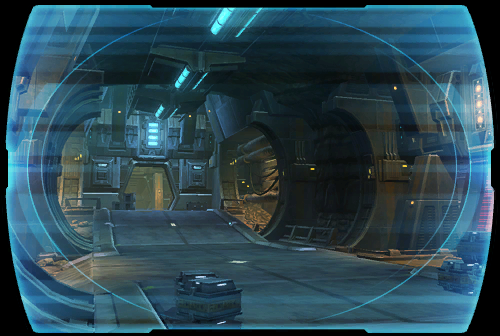 When positioned over a planet, Hammer Station was capable of devastating entire cities in a single shot. However, Hammer Station's attacks could not be tempered. The asteroids caused planet-wide dust clouds and groundquakes, rendering entire worlds nearly uninhabitable. After seeing the destruction, the Republic Senate could not authorize its use, even against the Empire, and ordered the project scrapped. The Hammer Station project files were classified and later destroyed in a Senate tower bombing after the Treaty of Coruscant was signed. Achievement: You have defeated Battlelord Kreshan in the Hammer Station flashpoint.